Roll of Honour. It is with sincere regret, in which we feel sure we are joined by the whole of our readers, that we chronicle the fact that Lieutenant Robert Hamilton Poynder of the South Staffordshire Regiment, only son of the Reverend A Poynder of St Pauls and Mrs Poynder, has been killed in action. This gallant officer was educated at Dean Close School in Cheltenham and Victoria College, where he was in the OTC. Though of a somewhat retiring disposition Bob Poynder, as he was more generally known, by his splendid character endeared himself to all he came into contact with and had a large circle of friends. 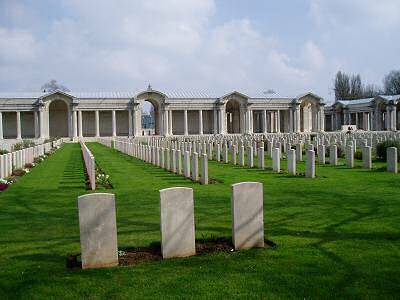 Though not one of those who would have chosen the Army as a profession, when the call of duty came he was not found wanting and loyally offered his services and in 1915 was gazetted 2nd Lieutenant in the 1st Battalion South Staffordshire Regiment. He had been in France for a considerable period and was gazetted Lieutenant some time back having proved himself a most painstaking and efficient officer held in the highest regard by his superiors and highly respected by his men. 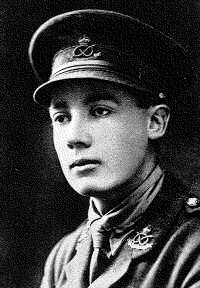 He only returned to the Front from leave a few weeks back and was in the memorable Battle of Cambrai, his division being one of those specially congratulated by Sir Douglas Haig for holding a most important part of the line and so saving the situation at a critical time. In the heavy fighting on 24 March his Company was overwhelmed by the enemy and he was shot in the chest, the gallant officer dying with his face to the foe. We would offer our sincere condolences to the Reverend, Mrs and Miss Poynder in their great bereavement. 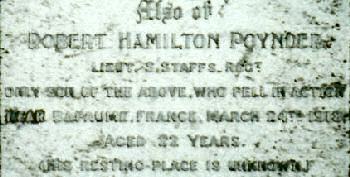 Killed in action, aged 22 years. Impressive Service at St Pauls - Memorial Tablet Unveiled to the Late Lieutenant R H Poynder. Ample testimony to the high regard and esteem in which the late Lieutenant R H Poynder of the South Staffordshire Regiment, only son of the Reverend & Mrs A Poynder, was held by all classes of the community was afforded by the large congregation which gathered at St Pauls Church this morning when a tablet to his memory, erected by the members of St Pauls congregation, was unveiled by the Very Reverend the Dean. The congregation, which as stated above was large, was representative of all the members of St Pauls church and included, as representing the younger generation, two patrols of St Pauls Boy Scouts. The service was the form of intercession which has been used at the church each Friday morning since the outbreak of war. Whilst the congregation was assembling Mr J Hubert, organist of St Helier Parish Church, played suitable music and as the bell finished tolling the strains of "I Know That My Redeemer Liveth" pealed out. The first portion of the service, which all through was of a most impressive nature, was conducted by the Reverend A Poynder. During the second part of the service the names of the large number of those serving in the Forces from St Pauls were read out. Following the singing of "Jesus Lives" the Dean advanced to the east end of the north wall on which the tablet had been placed, this being covered with a Union Jack. Addressing the congregation the Dean said they had met together that morning to unveil this tablet to one of their number, and he then pulled aside the Union Jack revealing the tablet. Continuing the Dean said that it was a curious thing how men and women quickly forgot the dark days of the past but in the present atmosphere of victory we should not forget the gloomy hours when everything seemed to be hanging by a thread. The Dean went on to say that Lieutenant Poynder fell leading his Company against the enemy to save Paris, to save England, to save Jersey and to save all of us, he fell so that we in this Island could live in peace, and when we looked at the tablet we would remember him and many others who had gone. 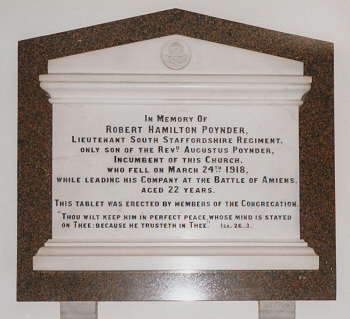 The memorial tablet, which is white marble on a base of polished Aberdeen granite is headed by the crest of the South Staffordshire Regiment and bears the following inscription "In memory of Robert Hamilton Poynder Lieutenant South Staffordshire Regiment only son of Reverend Augustus Poynder incumbent of this church who fell on 24 March 1918 while leading his Company at the battle of Amiens, aged 22 years. This tablet was erected by members of the congregation. Thou wilt keep him in perfect peace whose mind is stayed on Thee because he trust in Thee". Near by is another memorial tablet to Lieutenant R J R Richardson of the same Regiment who fell in 1915.